Russian Leather Belt. 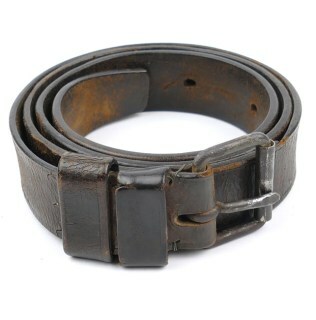 The leather construction belt is in good used condition, the belt has been periodically repaired, see photos. It is not visible maker marked or dated. Nice original Russian Belt in used condition! Russian PPSh-41 Soviet submachine gun. This example is made in 1944 and is fitted with a drum magazine. The PPSh has been deactivated conform the requirements of the common minimum technical specifications set out in Annex I from the Commission Implementing Regulation (EU) 2015/2403. Russian PPs-43 Soviet submachine gun. This example is made in 1955 and is complete with original magazine. The PPS has been deactivated conform the requirements of the common minimum technical specifications set out in Annex I from the Commission Implementing Regulation (EU) 2015/2403. Russian SSh40 (СШ-40) helmet. 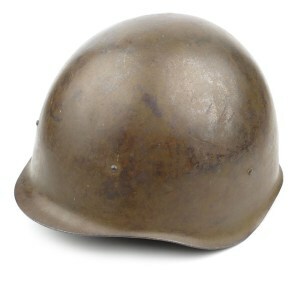 The helmet is complete with it's original liner and incomplete chinstrap, the shell is marked with P-1 and dated 1944. Hard to find original WW2 Russian helmet in good used condition! Russian SSh40 (СШ-40) helmet. 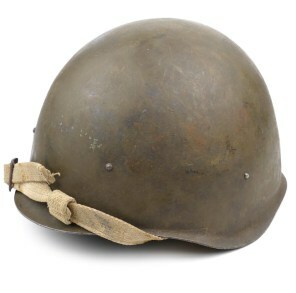 The helmet is complete with it's original liner and chinstrap, the shell is marked with P-1 and dated 1945. Hard to find original WW2 Russian helmet in good used condition! 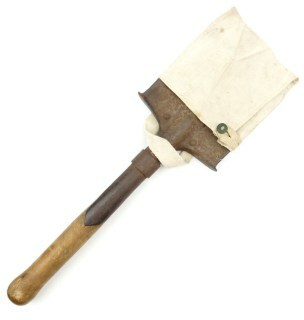 Russian Entrenching Tool with carrying cover. The white coloured canvas cover is nicely maker marked and dated 1941r. The Shovel is nicely maker marked and dated 1940r. Nice original Russian shovel in good used condition! Russian Mess Kit. 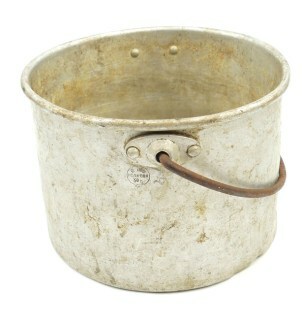 The aluminum mess kit is nicely maker marked and dated 1930 (30r), it complete with it's original iron carrying handle. Rare original Russian Mess Kit in good used condition! 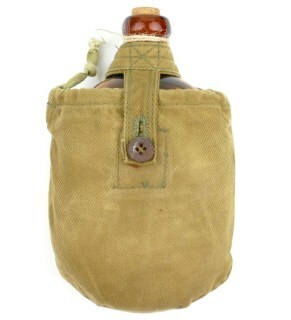 Russian glass canteen in canvas cover. The orange/brown glass canteen is complete with cork. The cover shows normal period aging, the cover is nicely maker marked and dated 1943. Nice original canteen in good used condition! Nice original standard 1936 pattern Russian, Red Army, two-piece construction cap-badge enamelled star cap-badge (31mm version). The cap-badge is complete with both prongs. Nice original example in good used condition! Russian Webbing Belt. 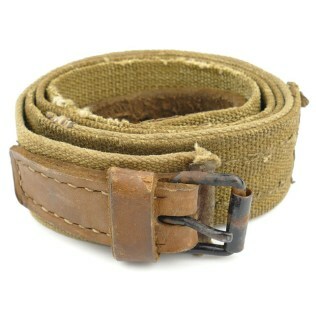 The webbing and leather construction belt is in good used condition, the belt has been periodically extended. It is not visible maker marked or dated. Rare and hard to find original Russian Belt! Russian PPSh-41 Soviet submachine gun. 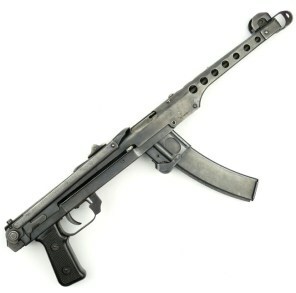 This example is made in 1945 and is fitted with a drum magazine. The PPSh has been deactivated conform the requirements of the common minimum technical specifications set out in Annex I from the Commission Implementing Regulation (EU) 2015/2403. Nice original standard 1936 pattern Russian, Red Army, two-piece construction cap-badge enamelled star cap-badge (31mm version). The cap-badge is regrettably missing one prong. Nice original example in good used condition! Nice original 1935 pattern Russian, Red Army Senior Officer (General) hat badge, larger 36mm sized version for a winter hat, 1935-1940, two-piece construction enamelled star cap-badge. complete with both prongs. Scarce original example in very good condition! 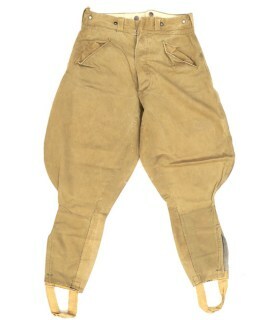 World War 2 Soviet Russian Breeches. The light weight olive/khaki cotton construction breeches are partially made of captured German material, see photos. The trousers are in good worn condition. Rare and hard to find original WW2 period Russian breeches! 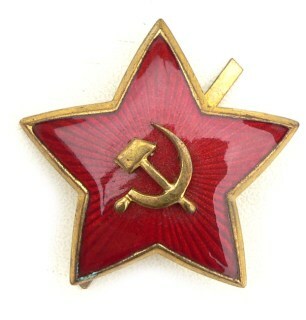 Nice original Russian Political Commissar Sleeve Badge. 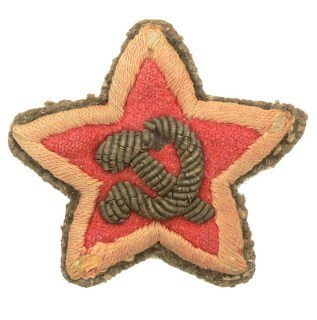 Nicely hand-embroiderd sleeve badge, showing the recognizable hammer & sickle in a 5-pointed red star. The badge is sized approximately 5x5 cms. The badge is in good used and clearly tunic removed condition! Russian F1 Grenade Bag for three F1 Grenade's (ручная граната Ф-1). The bag shows normal period aging, the pouch is nicely maker marked and dated 1945r. Nice example in good unissued condition! 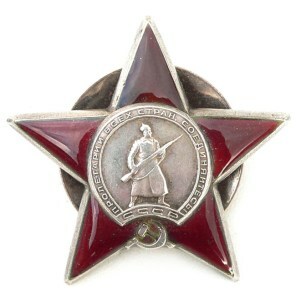 Sovjet 'Order of the Red Star'. The order is nicely maker marked by the Mint of Moscow (МОНЕТНЬІЙ ДВОР) and is marked with the unique serial number #1131762 indicating that this example has been awarded in 1945. Nice original example in very good condition! Rare original Russian 6x30 binoculars, with carrying strap. Nicely maker marked and dated 1932r. Nice original example in good used condition, a nice and honest piece of equipment! Russian Order of the Red Banner of Labour (Орден Трудового Красного Знамени). The medal is nicely maker marked and engraved on the back with the unique recipient's number '222133' which is a low number. Scarce medal in good used condition! 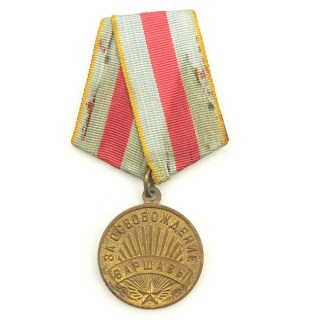 Medal "For the Liberation of Warsaw" (Медаль 'За освобождение Варшавы'). TThe medal is complete with it's original ribbon set-up which is complete with pin-back device. Nice example in good used condition! 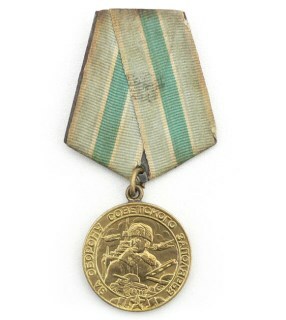 Medal "For the Defence of the Soviet Transarctic" (Медаль 'За оборону Советского Заполярья'). The medal is complete with it's original ribbon set-up which is complete with pin-back device. Nice example in good used condition!